William and Mary Hammond had eight children, four sons and four daughters, all of whom were baptised and buried at Whitton St Mary and all except Edmund, died unmarried and Edmund had no issue. On William’s death in 1725, his eldest son John Hammond, baptised 28 October 1692 and buried 6 June 1733, inherited. At his death he also held other manors in Suffolk, Warwickshire, Devon, Somerset and Cornwall, some of which his father had inherited from his aunt Margaret Father of Yoxford, Suffolk. John was succeeded by brother William Hammond, baptised 17 December 1696 and was of Great Russell Street, London and buried at Whitton St Mary on 5 November 1747. On his death, brother Edmund Hammond inherited, who was baptised 23 October 1701 and married at All Hallows church, London Wall on 7 December 1738 Mary Heathcote who pre-deceased him without issue. Edmund was buried on 4 November 1759 leaving only a spinster sister Esther. The other children of William Hammond were Elizabeth, baptised 14 August 1694 and buried 30 April 1734, Mary, baptised 27 July 1699, Rachel baptised 27 November 1702 and Thomas baptised 26 September 1705 and buried 7 April 1743. Under the terms of Edmund’s will he left his sister and sole Hammond survivor, Esther as life tenant who died on 29 December 1760 (Muskett Manorial Families Vol. III). William had left an annuity of £20, to be doubled on the death of his sister Esther, to Suffolk author Clara Reeve (1729-1827) this annuity soon doubled as Esther died only a year later (Suffolk Writers vol. 1. 2000). Clara Reeve, born on 16 January 1729, one of the ten children of Revd William Reeve, rector of Kirton and Freston as well as perpetual curate of St. Nicholas, Ipswich, and his wife Hannah, daughter of William Smythies, a jeweller. Revd William Reeve was an intimate friend of the Hammond family with whom Clara resided as a companion to Miss Esther Hammond, whilst her brother Edmund spent a considerable time on the continent. Clara amused herself with the considerable library at Sparrowe’s Nest. On the death of Esther Hammond, Clara moved to Colchester, returning to Ipswich living in ‘The Old House’, Carr Street with ironfounder Allen Ransome and his family. James Ransome’s father James Edward Ransome had married Alice, daughter of Samuel Chilton Gross (1797-1844) and Anne Woolnough. Clara died at the residence of a Mr. Dale in St. Clement’s parish, Ipswich on the 3 December 1807, aged 78, and buried in an unmarked grave, next to that of Revd Samuel Darby (1721-1794), in St. Stephen’s churchyard. Esther Hammond’s will devised her property to her cousin Elizabeth, wife of Michael Heathcote, there is no mention of Clara Reeve, who Miss Hammond may have thought, had already been well provided for. The annuity, so soon doubled, was enjoyed by Clara for 46 years after Esther’s death. 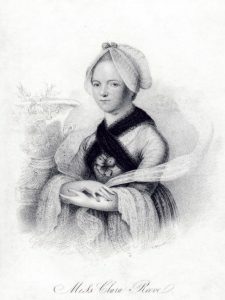 Nine years into her new annuity Clara published her Original Poems on Several Occasions by C. R. (London 1769) which had among the subscribers Wm. Hamilton, Esq., the good man had taken no less than eight copies. As Esther Hammond remained unmarried and their were no heirs, under the terms of Edmund’s will the property passed to William Hamilton, a merchant at Naples, apparently a friend. This is the last Will and Testament of me Edmund Hammond of Whitton in the county of Suffolk, Esquire, that is to say I hereby subject and charge my Real Estates with one Annuity or Rent charge of Twenty Pounds a year to be paid unto William Hamilton, now residing in Naples by half yearly payments at day…day during his natural life and whilst I hereby give and bequeath to him and also with one other Annuitys or yearly sum of Twenty Pounds to be paid unto Miss Clara Reeve now living with me during the joint lives of herself and my sister Esther Hammond and in case she shall happen to survive my sister then I will that the said annuity shall be increased to Forty Pounds a year and shall be paid to the said Miss Clara Reeve during so long a time as he shall happen to survive my sister by four quarterly payments at usual Feast Days for paying rent…and devise all my…Messuages and Tenements and Heridiments and all my stocks and shares of such and other my Real Estates after payment of all my debts, legacys and the said several annuitys and with…subject and charge all my estates unto my sister Esther Hammond for and during the term of her natural life and after her decease unto the first son of her body lawfully to he begotten and the heir male of such son lawfully issues and for the default of such sons unto the second and all other sons of my said sister such first only intail Males and for default unto the daughter or daughters of my said sister if more than one to take as tenants in common… then to William Hamilton, gent. of Naples. R.H. – (doubtless for Rachel Hammond). This is the coffin with outer wooden case. M.H. obt. Janr. 19. 1743. Aeat 43 – Mary Hammond daughter of William and Mary. Above the inscription is a large heater-shaped shield, measuring 12 ins. by 11 ins. bearing arms in bold relief:- Hammond, per pale (Or and Az. ), three demi-lions passant guardant, two and on, and between them in quatrefoil charged with five Ermine spots, impaling Hook – quarterly, one and four, a cross between four escallops, two and three, seven fusils conjoined in bend, each with charged with an Ermine spot; over all an inescutcheon, Hook – quarterly as before. Probably the coffin of Mr. William Hammond, but name-plate could not be read, as another coffin rested upon it. John Hammond. Esquire. Died May 31st 1733. E[lizabeth]. Hammond. died April 23. 1734. Above the name is a lozenge, but the foot of Edmund Hammond’s coffin (No. 7) covers it. Probably the coffin of Thomas Hammond, but Edmund Hammond’s coffin rests upon it, so a name-plate could not be read. The coffin-plate of Thomas Hammond was found lying against the wall, and was probably torn off No 6. when No 7 was placed upon it. The inscription is Mr Thos. Hammond. Died 30th March 1743, aged 34 years. Edmundus Hammond, Arminger, obt. Jany. 29. 1759. Aetat 56. Mris Esther Hammond. Died 29th Decr. 1760. Aged 54.